Tonnages: 14,651 gross 9,899 net 23,710 deadweight. 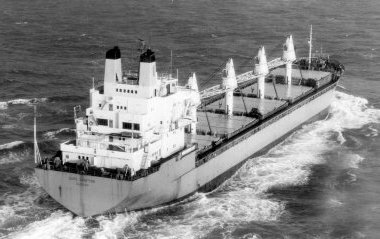 December 1971: Completed by Haugesund Mekaniske Verksted, Haugesund (Yard No. 41) for Lyle Shipping Co. Ltd., Glasgow. Scottish Ship Management Ltd., Glasgow, managers. Maiden Voyage: Haugesund to Hampton Roads, loaded coal for Japan. 1973: Re-engined by Amsterdamsche Droogdok Maatschappij, Amsterdam with two Stork Werkspoor 12 TM 410 Medium Speed Engines. 12,000 bhp 15 knots. 1980: Sold, Hae Yung Shipping Co. Ltd. South Korean flag, renamed HAE YUNG GOLD. 1985: Hae Yung Shipping Co. Ltd. into liquidation. Vessel taken over by the mortgagees, Korean Development Bank and laid up at Busan, South Korea. 1986: Broken up by Sin Seo Industry Co. Ltd. Busan. Work commenced 24th March.